As a natural testosterone support supplement for building muscle, Thrust exceeds standard market expectations. As long as the Thrust user can maintain a healthy diet, lift serious weights, and get the right amount of sleep at night – this T-boosting supplement will be a major benefit with noticeable lifestyle, libido, and performance results. From start to finish, taking Thrust is a satisfying experience. For us it certainly was, bringing forth lean gains, energy increase, and overall aesthetic improvements. Here, we will outline why thrust is a great T-boosting supplement. 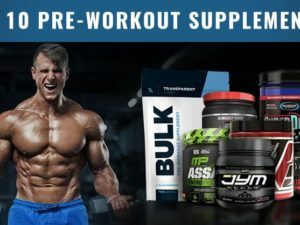 The entire staff here at BestWorkoutSupplementsBlog.com has a great deal of experience with t-boosting supplements and testosterone optimization as a whole. For any serious athlete, bodybuilder, or self-improving male; it’s essential. In all reality, you can really improve your resting testosterone levels just by proper diet and habitual sleep alone. 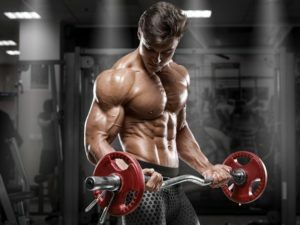 However, if you can pair these testosterone supporting habits with a supplement specially designed for t-support like Thrust – your game can reach a whole new level. Alternatively, if you are actively making changes to optimize your test levels, a supplement like Thrust can really “wake you up” to the benefits and make the transformation a more pleasant process. 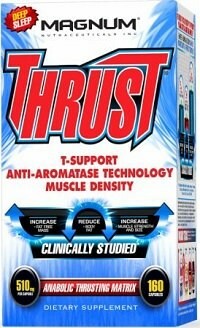 For us, taking Thrust was a part of an already flourishing testosterone supporting lifestyle. Which in all reality makes it harder to judge the effects of a t-booster. Nevertheless, Thrust proved its worth to us with primarily lean muscle gains and anti-aromatization action. We started Thrust on a Monday and by that coming Friday its t-boosting effects began to take notice. While supplementing with Thrust, we followed the directions meticulously. That meant, 4 capsules before breakfast and 4 capsules before bed. On training days this varied to 4 capsules before training and 4 capsules before bed. Yes, this means 8 pills per day. To some, this may look like a lot of work, but to us, it looked like a lot of active ingredients which is awesome. While supplementing with Thrust, we did not have any stomach upset from taking servings without food before meals. On the directions, you will see that the preferred method for taking Thrust is without food. However, if it is rough on your stomach you can take it alongside food to rid of any issues. As with any test booster that works, your gym performance is going to go up in a brilliant way. It’s like packing 3 months of progress into 1 month with the force of a freight train. It’s beautiful. Thrust offered this with the extra benefit of potent anti-aromatization (aka estrogen reduction) which took our aesthetics to the next level. See, the beautiful thing about getting a really great high testosterone to low estrogen ratio is what happens to water weight – it disappears. And, when this happens – striations become very impressive. With that being said, your arms are going to look better than ever in the gym while lifting even if you are eating like someone in their bulk phase. It’s straight awesome. Outside of the gym, Thrust is going to help you face the day by the mental benefits of high testosterone. As a whole, men with high testosterone are concise, motivated, and ‘alpha’. These characteristics are not present in men with high estrogen and low testosterone, period. Along with these characteristic benefits, Thrust will also have a way of helping you sleep more adequately and wake up feeling more-ready to face the day. Again, these are characteristics of high testosterone. Like, increased arousal and intimate performance. If you are living properly, Thrust is going to be a great experience for you; like the other Magnum Nutraceutical products. However, it is worth noting that you have every opportunity to ruin it. If you’re not lifting, not eating well, and not sleeping; this product as well as any other really won’t have any benefit. All of the responsibility is directly in your hands. As a whole, the best workout supplements are nothing more than potentiators. They potentiate what you do, and without that initial effort by yourself, there is nothing to work with. However, if you grind like you mean it, and truly face the music; quality supplements like Thrust can have a multiplicative effect.